Lincoln was not a lucky guy. At age seven, he was forced to make money for his family. At nine, his mother passed, forcing him to work even harder. At twenty Lincoln lost his seemingly stable job as store clerk … and then by twenty-three he went into debt trying to become partner in a small store. Three years later, just as his store was picking up speed, his business partner died, leaving him in even more debt. At twenty-eight, after dating a girl for four years, he got up the gumption to propose. She said no. Later, when he did eventually marry, his son died at age four. At forty-five, Lincoln ran for the Senate. Again: no-go. At forty-seven Lincoln ran for vice-presidency. But… well…You got it. More no-go, amigo. At fifty-one, Lincoln was elected President of the United States… which, considering his life resume of consistent failure, was a very snazzy title. How could Lincoln have made such a positive plea during a time of such suffering? Because Lincoln recognized that even in the midst of tough times, there was always something to be appreciative about. Lincoln had a naturally grateful heart. As a creative consultant helping people to succeed in their passions, I’ve seen how the power of gratitude can not only change a person’s mood, but their results. YOUR ASSIGNMENT: Make it a habit to end each day talking with your loved ones about what you appreciated about your day. What made you happy? Proud? Excited? Feel loved? By talking about it with your loved ones, you get double the perky perks, because you’re not only reminding yourself to keep a grateful heart, you’re connecting heart-to-heart! 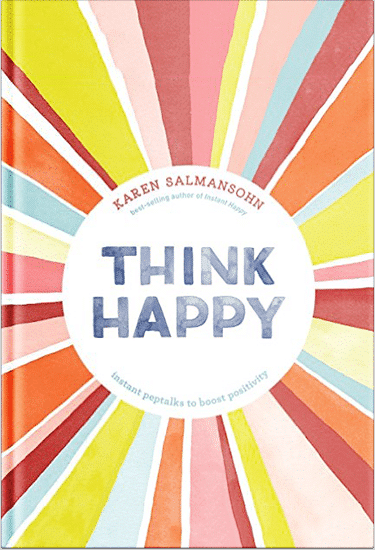 Need a little extra support to think happy?